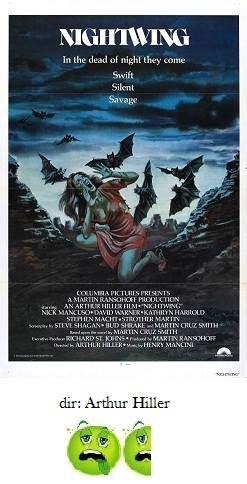 When is a killer vampire-bat movie not a killer vampire-bat movie? When it's the super-pretentious and super-boring Nightwing, a failed attempt to graft Native American spiritualism onto a big budget creature feature. Nightwing takes place in a small desert community, and one day a rancher finds dead livestock. The animals' bodies are covered with mysterious bites and are drained of all their blood. What could it be? No, not chupacabra. Anyway, this event occurs at the same time that a shaman from the local Maski tribe has created a cursed sand painting that will unleash a punishment from the gods against the white citizens. Are they related? Even the movie can't really answer that question. Also, a local Native American politician is trying to option off sacred lands to an oil-drilling company. Our protagonist is the local Maski law enforcement officer, played by Nick Mancuso. He doesn't believe any of the shaman's mumbo-jumbo and prefers to take dips at the local hot springs with doctor Kathryn Harrold. The last major player in Nightwing is uber-ham David Warner who shows up with lots of electronic equipment, maps, weapons and poisons. It seems that Warner is a freelance vampire-bat hunter who has been tracking colonies all over the western hemisphere. So, enough about plot, what about the bats? Well, the bats are relegated to a supporting role in their own movie. There is exactly one vampire bat attack scene. One. It occurs at the halfway mark where Harrold and three campers are besieged by the bloodthirsty horde and, to be fair, it's pretty effective. The bat effects look real enough (or real enough for 1979), but they only serve to underline the fact that Nightwing just needed a whole lot more of them. The finale has Warner, Mancuso and Harrold finding the cave that the bats are congregating in and attempt to set them on fire. But before that can happen Mancuso has a vision of various Maski spirits and the dead shaman and then he finds the sand painting and wipes it away. So, the bats are flambed and the credits roll and it's time to wake up. Nightwing deserves some credit for trying to be something more than just a straight-forward horror movie, but it's too long-winded and does all it can to subvert anything resembling tension or suspense. The acting is good and the direction is adequate but it's just very, very slow going. It almost makes you long for 1999's Bats. Well, almost.